Some sweethearts find it hard to believe that this is a true story (and not fiction). I have lived and loved in all these chapters. Jerry does not only exist in my imagination, he also lives in the real world. Get over it jhorr. Lol. The highlight of a story is the most important, interesting or enjoyable part of it. Now let's talk about what makes a relationship look like Magic and Wonder. My smiles made me approachable. And when Jerry had the opportunity to speak with me, he didn't blab. He seized the day. Jerry saw the need to keep in touch, so he collected my phone number. Jerry called. He was determined to be my friend. He showed me he cared. I didn't want to be an easy-to-get kinda girl. I stopped picking his calls. Jerry persisted. We fixed a date and he told me what he wanted right there. I decided to give him a chance. Anyway, you don't have to kiss on a first date like I did. I had already fallen in love with Jerry but I still wanted to be sure. So I asked God in a funny way. Being so in love with Jerry, I wanted his kisses again and again. He refused. Jerry set the boundaries which I thought was crazy. But I realized it had always been what I hoped for. Jerry and I have special names for each other. We are so proud to be together for such a time as this. We feel lucky. 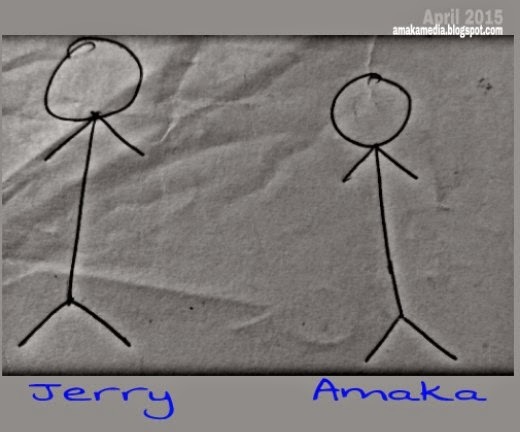 Jerry and I do not hide what we feel for each other. "I love you" is like having our bath every morning. We just have to say it. Jerry hadn't call me. I was worried-sick. I thought about all the things that could have possibly happened. But I never for once thought he was with another woman. Except that woman on the phone. I respect Jerry. I should think he respects me too. But why would he call me by my first name? Oh well. . . I know a man who loves me. His name is Jerry. While I use my charm, he uses his poise. It's as real as it is. This is a script I've acted out with my life. I'm like; Could God be writing my very own love story already?! Lol. Why would you want to see his face? "just live each day as it comes. . ." That's exactly what I'm doing. Thanks, sweetie! Oh my god! its reeeaal??? wow! Does jerry know about this space??? Live and love dear life is too short. Hope we'll be reading more of you guys, this sounds like the end? Yayy! Sweet Debbie, glad to have you back! I've headed straight to your blog! Jerry. . . *scratches head* I think so. Let's call it 'the secret of a movie-like relationship'. Lol. Thanks for your beautiful comment about my blog. You, yes you make it so. Will visit your blog soon. Stay sweet. I wish you nothing but luck and more love between both of you.. True love is the sweetest thing ever aside God i am a proof. Come Amaka, hightlights does not say the story is ended. Abi? it better not end when.am already into the story. lol. My best chapters are chapter 3, 7, 8. the kiss and the chat of solomon was epic! Greet Mr. Magic for me. Wow! I love this. so many relationship tips in one post. He that has eyes let him see. Amaka, you're a real gem. How you dey take do this thing? Do which thing? Please o. . . I'm innocent. I dunno what you're talking about. lol. I wish you the best dear. Enjoy! May u both grow stronger. Cheers dearie. Wow. Your fingernails............ so this is for real? I'm happy for you dear. Congratulations. i cant stop laughing,huh! thats why you showed off your finger nails yesterday.nne you are too intelligent for my liking. This is beautiful. Love is a beautiful thing and if you find love guard it with all that is within you..